Proving that it's not only Apple and Samsung that have the monopoly on patenting (and counter-patenting), Microsoft just bagged a beauty they are calling the variable formatting of cells. This covers the "variable formatting for cells in computer spreadsheets, tables, and other documents, such as using the spectrum from a first color to a second color to represent the values in or associated with each cell". Now you can call it what you want but to me and many others this sounds remarkably like a technique that map-makers have been using for decades. We call it a choropleth (not to be confused with a chloropleth). Baron Pierre Charles Dupin is widely recognised as creating the first of its type and the term itself was introduced by geographer John Wright in 1938. Slashdot has some fun comments on the topic. Let's not forget it wasn't long ago that Apple themselves filed for a patent for "schematic maps". Soon all map types will be taken and there will be nothing left for us mere mortals to draw. My blog post last week entitled Cartomyopia got quite an interesting reaction from a wide range of people. Generally, I received very positive feedback with a good number of people relating well to the general argument I was trying to articulate. I did manage to irk Tom MacWright (@tmcw) of MapBox though. We had a brief Twitter exchange and Tom then wrote up some of his own thoughts over at github. Blogs are consumed by all sorts of different people for whatever reasons they might be vaguely interested. I do not know Tom either personally or professionally. I know a little of his work and those of his colleagues and they are making a really valuable contribution to the world of mapping. Likewise, Tom doesn't know me (made clear in his comments). Here's where it gets potentially sticky...Tom clearly disagreed with a number of points I made but based on false presumptions in many instances. That's fine...it's his prerogative....though the point of this sequel is to just throw a little light on my background and try and offer some additional context based on the points he rasied. If I understand, I'm badged as an academic. Tom has a hacking mindset. The former is perceived to think of cartography via books and papers and then apply theory to make a map. The latter has a go, iterates and makes a map that way. It's too simplistic a view. I first hacked a map together using GIMMS in the late 1980s. I've coded my fair share of maps using a range of different languages (GIMMS, AML, Avenue, ArcObjects, Processing). I have run a successful cartographic consultancy as well as worked for a number of non-profit organisations. I've also used just about every commercial and open source GIS, cartographic and illustrative software that's been around since the early 90s. So yes, I understand the academic mindset...but the assumption I don't understand or appreciate the hacking mindset is a little wide of the mark. I agree, it is not how I have spent the majority of my career to date but there seems to be some sort of impression about what an academic is and does...it's so often wide of the mark. Yes...they can; but this doesn't make me angry. I see it as a challenge and an opportunity which was the whole thrust of the blog. My comment "I don't know what it is about maps but for some reason everyone thinks they can make one." in the original blog is not meant to be taken out of context. I was referring to the idea that many (most?) people think their maps work when actually, they might not. Yes, they can make one but do they have the understanding to know if it actually works or is fit for purpose? I own a nice set of cooking pans. I can throw together a meal but I'm not a chef. If I want to make something a little more nuanced then I'll consult someone who knows the recipe, a book, a web site, my mum(!) to inform my cooking. In my experience cartography is often eschewed by amateur map-makers probably because they don't even know it exists. When they find out (or are shown)...they generally find it useful and the light gets switched on. Their map-making becomes all the more informed because of it. This doesn't have to be academically driven...many of the great cartographic works were made by non-cartographers which is both hugely ironic but also serves as a reminder that cartographers don't own map-making. All they can claim is they have had a form of training that gives them insight and a knowledge base on which to call upon to inform their work. Most of my favorite maps are by non-cartographers. So are the majority of maps made these days. I just advocate that those with a little cartographic knowledge might be able to both offer help and also do so without being condescending to improve maps in general terms. I've seen this debate on both sides. In University we had an embarrassment of riches and access to all sorts of software and data at reduced cost. Students often found themselves at a loss on graduation when they realised they no longer had access to the 'expensive' software and 'free' data. But there are alternatives and a ridiculous amount of choice. Cost is no longer a barrier to making a good map. We're not so much seeing a democratisation of mapping but a democratisation of both the tools and data to allow people to make the maps...these drivers have supported one another. Commercial software has a place. So does free. People will (mostly) make their own choices as to what they need, want, can afford etc to support their own endeavors. Technology comes in all shapes and sizes. I've used most of it to a greater or lesser extent over the last 20 odd years. I have my preferences...and even those preferences come with irritating limitations but hey, we each choose our sword of choice and make the best of it. My choice might not be to everyone's taste but there are plenty of alternatives to suit every taste and pocket. No, they are intrinsically connected but my impression over the last couple of years has been that form is overtaking function. Too few are imbuing their maps with good data preparation and analysis and choosing a suitable mapping technique to communicate effectively. I'm not being a grouche...merely observing a trend. Do we want a world of picto-bite mapping or a world of well constructed maps? I don't have a problem with popular or short-lived maps (I did a load for the Olympics...all worthless now but they went well for a couple of weeks) but I would like to see the search for the next cool 'looking' map at least matched by the next cool 'constructed' map. NYT are doing a great job of getting the balance right...and that's all I'm advocating...finding a balance between form and function so that one supports the other. If you check out some of my previous work and look at the back-story to some maps I've made they are deliberately playful in how they balance form with function...particularly one whose function was to win a competition and whose form was designed with that (and the viewers in that arena) in mind. Sod the map...it was a blatant attempt to fool the viewing public and get votes (it worked). Form and function ARE connected. Evidence suggests that some map-makers need to work harder to get the balance right because too many maps overplay form. Carl Steinitz offered a memorable quote at a seminar I attended a couple of years ago: "too many data visualisations these days go round and round and up and down without saying very much and, worse, they're often accompanied by music". He states very eloquently where I stand on this. Form is great (and I like aesthetics and beauty in cartography as much as anyone)...but when it's matched by a well conceived and connected function that's when a map really works. Maybe Tom and I do disagree fundamentally here. So many maps these days are made without longevity in mind. Maybe that's a function of the fact they can be more easily made using a computer than a scribing pen (yes, I did used to make maps that way). I don't see this as bad per se, but I think it lulls people into a false sense of the map's value. The investment of time it used to take to make a map was far longer in most cases so my feeling is that people spent longer thinking about detail and finessing the map. Even MapBox's tagline includes the phrase 'publish in minutes' (and so do most other suppliers of map-making software or solutions I agree). Speed is vital but so is taking the time to think and work out the map. Even in my own degree course I recall spending an 11 week programming class building a single choropleth map. There were something like 800 lines of code that defined every single mark on the map. I had to think about every single mark, line, piece of text and so on. Now, I could make that same map in minutes (and probably make it go round and round and up and down accompanied by music) but would I be able to make a good map if I hadn't had a background that forced me to think carefully about each mark on the map? I'm not so sure. The map-making process is now compressed and made easy by many different map-making products and tools and yes, to some extent maps are being churned out at such a rate I feel that the overall quality is being diluted. Tom makes a great analogy to music and here's another...I see a lot of maps made by the latest kid who just won a reality tv show and think they're suddenly the next John Lennon. 3 minute wonders, over-hyped and without any sort of lasting career. The Beatles? Elvis? etc etc...lasting careers built on hard graft. There are always some terrific one-hit wonders (musically and in map-form) but do we want the map version of Billboard to be full of one-hit derivative numbers by talent contest winners? Again...balance is the key else culturally our mapping will become as sterile as reality tv and all those look-a-like contestants. The blog was a call to 'doing' and a call to taking a constructive rather than destructive approach to offering opinion and advice. I've been 'doing' pretty much most of my career. My personal blog is not the place I 'do'. For that you want to see my other work, my editorial stuff, my maps, my ICA Commission stuff, my seminars, my papers, my professional blogs my...everything else that I contribute to the community that provokes thought and comment and shares advice, expertise and such like. Interesting that Tom raised Colorbrewer as something that Axis maps have done for humanity. The irony here is that it was an academic project initially (Cindy Brewer and Mark Harrower). And in a beautiful twist, it was first published in the Journal I edit...The Cartographic Journal in 2003 for which it won a prestigious award as the best paper in that year. Sure, Mark re-programmed it and Axis now develop and host it (via his initial involvement) but it was an academic project that provided a great practical tool for map-makers. Here then...academia underpinning practical cartography and sharing precisely the sort of work that helps people make better maps. Commenting on someone's mindset and skillset on the back of reading a blog or two without reading their cv is not a good basis on which to characterise their wider contribution. And here's the crunch...Tom seemed to work up to the punchline that he feels there is no help and that cartographers are not willing to avail themselves of time or assistance. I said in the original blog that many that I knew are only too pleased to be asked advice and to offer help. It's often not asked for or wanted which is where the disconnect might stem from but...I've been offering free help for years. I'd be more than happy to look over people's work and offer what advice I might have. I've done that personally and in various capacities, professionally. I Chair an ICA Commission on Map Design and our un-paid remit is to support better mapping in the wider community. The same goes for all of the other ICA Commissions and I am quite sure if you have a question, anyone on the committees of these Commissions would be delighted to help. I am a member of a range of professional societies, most of which offer free (or nearly free!) advice. The British Cartographic Society has a range of seminars and school workshops for instance as well as a small book which retails at less than $10. NACIS has it's own very successful online forum in CartoTalk and its journal Cartographic Perspectives is open access (read: free!). The Society of Cartographers also hosts a free discussion list (CARTO-SoC) for both members and non-members. I wrote a brief blog entry not so long ago with a few ideas for assessing the quality of your own map (or at least avoiding major goofs) and in my day job I put together a sort of QC/QA checklist to evaluate your maps. These are just a few of the independent ones...there are vendor specific places to seek advice. My employer has a range of web-based help for those that choose to make their maps that way. There are plenty of repositories of examples and comment from other vendors as well...many of which are free to access. Ultimately, help is often available if only people ask. I'm quite sure those that base their livelihood on their advice will charge but there are many many others who won't charge. Want some advice? Here's my number...(kf.mapman@gmail.com). Call me maybe? This so-called division between old-skool cartographers and the new breed of map-makers has simply got to stop. This isn't the first time I've said so. Each has a really important role in the future of map-making and each needs to appreciate the approach and the value that the other brings. Building bridges and bringing people together is needed. Collaboration is the key. I don't care whether someone uses the latest open source package or some hideously expensive piece of proprietary software or whether they're creating a web map or a paper map, it's the final map product that interests me. It should be well formed, functional and designed to communicate. Technology moves rapidly and changes all the time...and maps can be built with a clear focus at the outset or as an organic process of experimental iteration. I'm one of those who is not afraid of technological change. I've had to deal with it throughout my career as one mapping platform has overtaken another. I've lost count of the number of different ways I've employed to make a simple map and the number of different platforms I've used to teach cartography...some easier than others, each with their infuriating compromises. Change is good. New map-makers are good. Holding on to out-moded views and not rolling with the punches is no good for anyone...but it doesn't mean we should disregard that vast body of cartographic work that can be used to make better maps. Academic cartography or hacking? Two worthwhile components in the wider world of cartography (there are, of course others as well!). Upon loading the map I must admit to feeling a sense of trepidation. It's really not the most pleasing of sights as you get Bing satellite imagery combined with a baffling array of place names at various sizes. Too much! And slapped on top are some rather odd looking marker symbols....but at least they are designed to be seen across the dark basemap and all that detail. Navigating the map is straightforward. The usual zoom and pan tools are available. 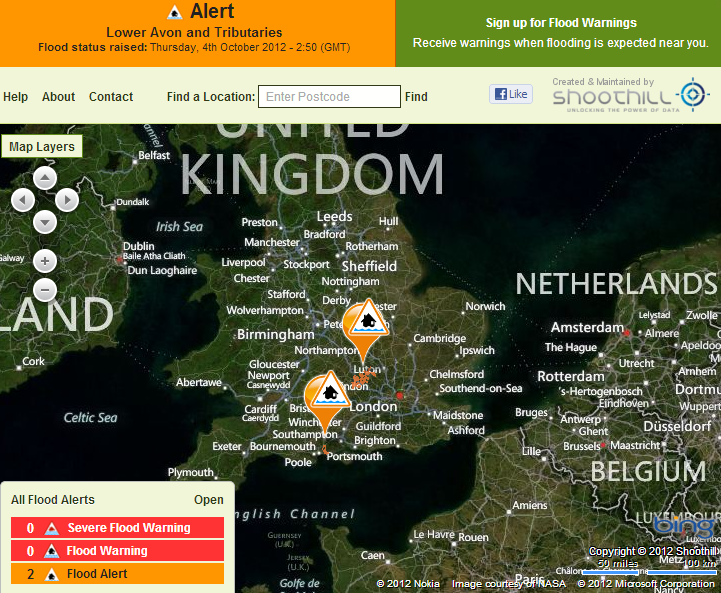 The flood alert legend in the bottom left corner shows the status of current alerts and you can open a more detailed description which allows you to zoom to the areas directly. You can also easily set the alerts to filter what the map should show thus giving you a customised view of specific flood issues rather than have them all display. The colours generally work well and the traffic light approach provides a good link to our perceptual order of 'danger'. I get an immediate sense of low level alerts and severe alerts simply through sensible use of colours. the marker symbols are a little over-complicated in my opinion. They seem to combine a point marker as well as a warning triangle. I wonder if the triangle would suffice since the point markers are only locating general areas anyway? They are clickable, giving access to further details...but the mouse pointer doesn't alter as you roll over them which doesn't distinguish them as offering any other content. It would help users to be able to know that the marker symbols are access controls to further information. As you zoom, map content scales nicely and you get to see actual flood risk surfaces appear. Personally, I'd like some further information on how these are calculated; and they aren't clickable so I don't get a sense of the scale of the potential threat other than visually. Is this important? Well it's a flood risk zone and it seems sensible to use this as a gateway to details about the risk rather than have them listed only by the more generally located marker symbol. There are options to switch between Bing imagery, Ordnance Survey raster data or a Bing road map and at different scales this becomes useful to ensure you can see the flood risk zones clearly. Of course, none of these are perfect solutions because the basemaps are not primarily designed to act as the underlay for operational layers like flood risk zones...but that's a perennial problem when mashing up polygonized operational overlays on top of general reference/purpose basemaps. A nice touch is the ability to apply some transparency to the flood risk zone layer...and also to invoke an 'emphasis layer' which adds a dark grey transparent wash across the map, effectively darkening the background and allowing emphasis to be given to the flood risk zones and markers. This is a novel way of countering over-cluttered basemaps in the event that you don't have access to a nice, clean de-cluttered basemap. The search works well and I managed to locate a range of places easily using either place names or postcodes and you can sign up to receive alerts via other mechanisms. Overall, a pretty good effort and a good example of a well constructed web map. It's not over-complicated and its use is fairly intuitive. I guess the only real question is the accuracy of the flood risk surface itself...when you dig into the help it's clear that the risk zones are a little spurious. Flood mapping is notoriously difficult and the map admits this. It states that the zones do not include information on flood depth, speed or volume of flow or groundwater, runoff and other sources. Hmm...so it's what then? It's a predicted surface of areas of risk based on what? Well that's not made clear and that's where maps like this fall over. On the face of it, it gives access to what many would view as a detailed and accurate map of flood risk. But it's only as detailed and accurate as the input data which is partial at best. The danger here is the map, while generally well presented, implies a level of accuracy that might not be valid. Not many (I would think) would read the help file to explore the details of how the risk surface was or wasn't constructed...they're going to go straight to their home location and see a great big orange or red polygon splattered over their house. Notwithstanding that the map explains that it shouldn't be used to infer any risk to individual properties, this is the natural inference. Implied accuracy is something that web maps in general need to wrestle with. People view maps as accurate (they always have). They rarely question them, they rarely ask the right questions about data efficacy, the mapping technique and how it was applied, or whether the map's form and function have been in any way subjectively manipulated. Since we look at web maps rapidly and want rapid information retrieval there is a need for the map to somehow qualify what it's showing so that on the one hand the potential risk is communicated to the public but without causing panic or hysteria through implied accuracy. One way this might be achieved is to create graded flood risk surfaces. At the moment it's a binary surface...the zone is either there or it isn't...and it's graded as Flood alert, Flood warning or Severe Flood warning. Why not code this in the map itself as a layer with different internal zones...and why not calculate some measure of how 'believable' the alert might be. For instance, not all areas have the same probability of flooding despite being in the same alert zone. This is more complicated but this is also where data science needs to meet web mapping to provide more accurate frameworks. So a map made for public consumption can be simple so that the public either don't need to think too hard or get bogged down with detail? Whereas if the map was made for 'GIS statistical analysis' (whatever that is) then we by definition require something altogether more complex because either we can handle complexity or we demand the detail to do more with it. I disagree here...and this is my beef with far too many maps (and web maps in particular)...they over-simplify and justify the approach is to satisfy a general public with low levels of understanding and cognitive capabilities. They don't want to create confusion so the answer is to create a very vague map using data that generalises. Actually the reverse is true...it's an art to take something with a complex structure and deal with it in a sophisticated manner to communicate the complexity clearly and without ambiguity. Just creating a simple version and claiming people don't want to do GIS analysis is a bit of a cop-out. Using the argument that the map was made for public consumption shouldn't absolve the map-maker of dealing with complexity in a sophisticated manner. I had a nice email discussion today about a map. I'll save the blushes of the person(s) who made it but it was a little (ahem!) sub-par. Thing is, it won't be long before it's touted by marketeers as being the next greatest thing....then it struck me. The world is suffering from a hideous new affliction...cartomyopia. I've been pondering for quite some time now how we can encourage people to make better maps. As an ex-University lecturer I could do this in class and students would enter the workforce able to make their analysis look good on a map and communicate properly. I'm very proud of a good number of my former students whose work makes me smile in the right way. I'm also proud to have been involved in the British Cartographic Society's Better Mapping workshops as far back as 2006. But what about those that never received any formal training or go to a workshop? What about those who can't be bothered reading a few pages from a book or a web site that shows them some useful tips? What about those who are just plain too arrogant to receive constructive criticism? Well, these people, my friends, are cartomyopic. They suffer from the short-sighted delusion that their carto work works...that it is beyond reproach and that no amount of advice or critical comment could possibly improve it. They suffer from a lack of awareness that cartography (and cartographers) might have something to offer to help them make their work better. I don't know what it is about maps but for some reason everyone thinks they can make one. Why is it when faced with the need to do some statistical analysis most will run a mile, not even engage in the process and try and find someone else to do the work...but when it comes to the map, sure, pass me the crayola and I'll whip one up for ya! It's partly because software makes it easier than ever and for those interested in making a map it's easy to see how it might be viewed in a similar light to writing a letter using Word or creating a photo album using Flickr. Cartography has gone mainstream....well, map-making has at the very least. Those who hang on to the notion that there remains a cartographic "profession" might want to take a reality check. They (we?) are now merely cartographic advisers. The minority. We might think we make better maps (and the proof often supports that argument) but there's only one way that map-making is headed...more mainstream. Andy Woodruff recently wrote a good blog over at Axis Maps on the problem of aesthetics in cartography and I think he touched on some useful points. If we go back 10 years, software provided the functionality to make a map. You pretty much had to make your fingers bleed to extract a decent map but the functions of the map were what drove the software's capabilities (class ranges, simple symbolisation, basic layouts). They weren't beautiful but they were at least functional. Those that needed to read them did so. Now...everyone wants to make a pretty map because as Woodruff states..."eye candy sells". Form is now overtaking function and our new breed of cartomyopic map-makers want a pretty map, made quickly, consumed in seconds by a large audience and then tossed in the bin because it's a transient object with a short shelf-life. The map is not meant to last. It matters only for a single event, sometimes in real-time and rarely meant to be lasting and the software now supports the ability to apply pretty effects to free data. This is picto-bite map-making (bit like sound-bite but in pictorial form) where the search for the viral map that captures attention is more important than creating a well constructed, purposeful product. Maps made by consumers for consumers, designed to be glanced at, have some sort of instant interest but no lasting purpose or appeal. Is this wrong? Well on one hand I'd say no...instantly appealing maps of events with a short life-span are fine (all those Olympics maps were only useful for a couple of weeks) but why should this mean they have to suffer from poor construction and function? Woodruff again: "Cartographic expertise is, in essence, knowing the right way to represent geographic phenomena and data for analytical or various other purposes, and understanding of all stages of the mapping process, not simply knowing how to swoop in at the end and make a map pretty. Sure, we can make every map delicious by wrapping it in metaphorical (or real?) bacon, but it won’t be good for you." This is cartomyopia...the short-sighted view that making a map look pretty will serve its purpose and not appreciating that it's fundamentally bad for you. So the big question is not how do we make people make better maps, it's how do we arrest this modern carto-plague and make cartomyopic people who already think they know how to make maps... make better maps. These people hate criticism and get most indignant if the error of their ways is pointed out; they hate being embarrassed by having mistakes pointed out...maybe that suggests deep down they do actually know? Working with them is the answer but here's the next big problem...they so rarely seek help or advice from a cartographer (possibly because they know it'll create more work) so the first time you get to see the work is often when it's published having gone through a marketing department that usually suffers from the even more chronic form of cartomyopia (application of modifications to make it even worse). This inevitably leads to criticism, apoplectic observations by cartonerds like me and the cycle of annoyance and the plethora of cartofails continues. So what's the prescription for cartomyopia? Well the first step is to get them to a meeting where they can admit, in a friendly and non-threatening way that they are a cartomyopic. No one will laugh. No-one will belittle them for their admission. Quite the opposite...most cartographers I know are crying out to help and provide the medication. We want to encourage better mapping and not just to make maps pretty. We want to help people see through their cartomyopia and learn that telling a good story with maps is not just about making any map-type object look good for an unassuming, uninitiated audience...its about making it work so they get the right message efficiently. In this sense, addressing the output is the wrong way to go about it. We need to address the process. We need to be seen as valuable at the outset of a project where maps are going to be made to encourage from within. We need to get marketing departments to value our opinions because ultimately a good map will 'sell' more. We need to be taken seriously for our expertise but in order for that to happen we need to overcome the scurge of cartomyopia. By the way...don't think I'm for one minute suggesting all cartographers are immune to bouts of cartomyopia. In its acute form we can all suffer....it comes in short bursts and usually ends with a close friend or colleague pointing out something so mind-numbingly obvious that we'd overlooked. Happens to me all the time...but what I try and do before unleashing a map on the world is address the issue before it gets out. That's all I'm encouraging others to do....manage their own cartomyopia and use the ready and willing support network of cartographers to do so.